Wish our site was also in English? We do too, and hopefully we'll manage to offer it in German and English someday, but until then this page will give you the condensed version in English and offer you some help navigating placing an order. We handmake our Wax Wraps out of four things- cotton, beeswax, tree resin, and jojoba oil. Because we want to offer the most earth-friendly product we can, we use organic cotton, organic local beeswax, sustainably harvested damar resin, and organic jojoba oil. To reduce the amount of plastic and packaging we throw away every day, and because they're so versatile and practical. They're antibacterial, breathable, washable, and reusable. They can adhere firmly to themselves and other things, and they also fold up flat so they don't take up much space when not in use. And they can be wiped off with a sponge so they're quick and easy to clean. In order for the beeswax wrap adhere to itself or onto an object it needs the warmth your hands. Just place your wrap over a bowl for example, then form it around the rim while pressing and holding for a few seconds. The warmth of your hands causes the wax to melt a tiny bit and that makes it adhere. For wrapping something up, use the same principle. Place what you want to wrap up onto the wrap and fold it up around it, then press and hold for a few seconds. Simply wipe them off with a damp sponge and a bit of dish soap if necessary, rinse under cold water, and let them air dry. Because they're made of beeswax they would melt in the dishwasher, so don't put them in there. 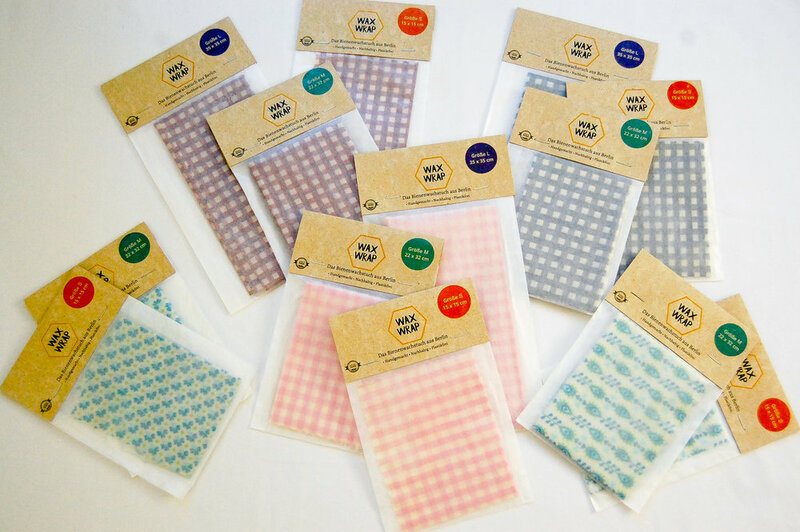 You can wash them with warm water, but we recommend not using hot water, as this will also cause the wax to start to melt and your beeswax wraps won't last as long as they should. Don't put your wax wrap in the dishwasher, microwave, oven, or washing machine (unless you want to ruin those appliances). But the fridge and freezer are fine! After a year or so you'll probably notice your Wax Wrap doesn't stick as well as it used to. That's because the tree resin, which gives it it's stickiness, gradually gets washed away when you scrub it clean. That's why we recommend you scrub gently when cleaning your wrap. If you want to prolong the life of your now not-so-sticky wrap you can freshen it up by putting in in the oven (with baking paper underneath) for a few minutes at low heat. Watch it until you see your Wax Wrap glistening — this means the mixture has redistributed and bits of tree resin that were stuck between the fibers will have come to the surface, making your wrap sticky again. When it’s glistening, remove the tray and immediately take your Wax Wrap off the tray, picking it up carefully by the corners. Wave it back and forth over the tray for a minute until it dries. You can repeat this process a few more times in the coming months as needed. Once freshening up your wrap in the oven no longer helps, you can use our wax bricks available in the online shop ("DIY Klötze") to re-wax your Wax Wrap. The blocks come with directions on how to do this (directions are also available in English). Otherwise, at the end of your wrap's life you can compost your wrap or cut it up and use the pieces as fire starters. You may notice tiny dark brown or black flecks on your Wax Wrap. These are bits of tree bark that are found in the resin, and although we filter the resin as best we can sometimes the very small bits remain. They aren't harmful and will get scrubbed away with time, but if you want you can use a toothpick to scratch them out and then smooth over the spot with your finger. But your webshop is in German, help! If you don't understand German that's okay, our webshop is organised simply and the checkout is all in English so you just need to make it to that point. The short video below will walk you through how to navigate our webshop. If you get confused or have questions just write us at hello@wax-wrap.de.